A quietish start to 2007. I gave up listening to England's pathetic efforts in the cricket and went to Onuma for the second time in 2 days. Yesterday I had seen a few Smew but it was too dark for a decent pic we returned today to the same place to try again. The smew had gone but there were 2 Geese. 1 Whitefronted and 1 Bean Goose together. 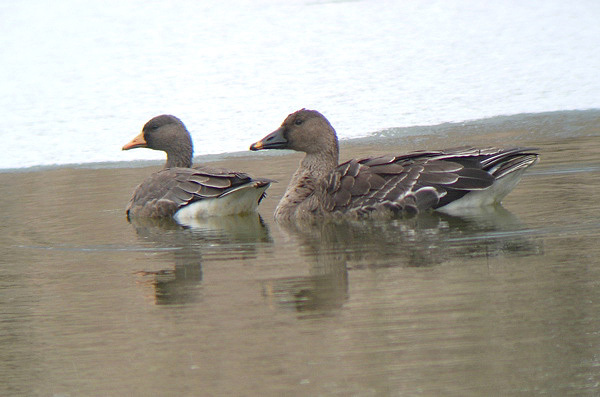 Grey Geese are pretty scarce down here in southern Hokkaido (they tend to bypass the region on their way south in autumn) so to see 2 different species together was pretty impressive. Not much else of interest in Onuma today or yesterday. Pick of the rest was a lone White Tailed Eagle. Today was a bit chilly but yesterday was very mild and the lakeside was prettty busy which limited photo oppurtunities. 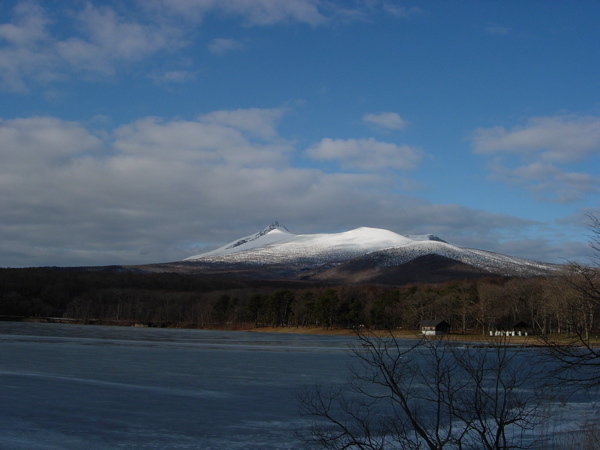 This is a pic of Mt Komagadake. An semi-active volcano that dominates the lake. 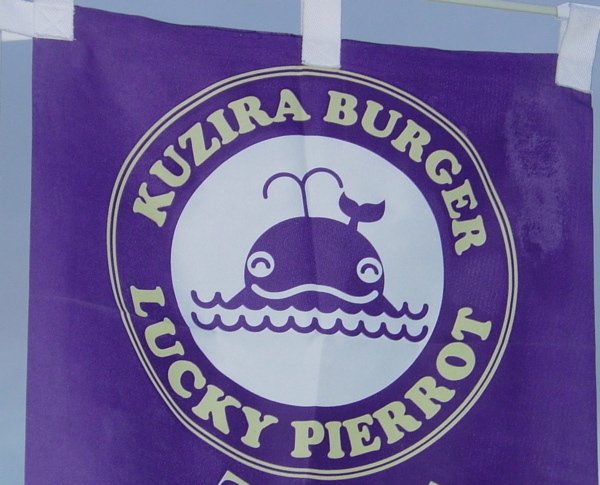 "Kuzira" (sic) is Japanese for Whale. This restaurant is a well-known chain in Hakodate and is a pretty bizarre experience all round. A new out-of-town branch opened a couple of months ago and is handy when I go birding in Onuma or Yakumo. It's a distictly Japanese take on the classic American burger bar. You can get normal(ish) burgers as well as whale, squid, shrimp and various other local favourites. 50's pop blares out. You can watch Japanese people eat squid pizza with chopsticks whilst listening to the Everly Brothers and contemplating your own burger dripping with nameless sauces that you wouldn't really expect to see on a burger. Still, it's cheap. At Kamiso a couple of days ago most of the birds from Jan 1st were still present plus 2 Great White Egret, 2 Glaucous Gull and a 1st winter Glaucous Winged Gull. 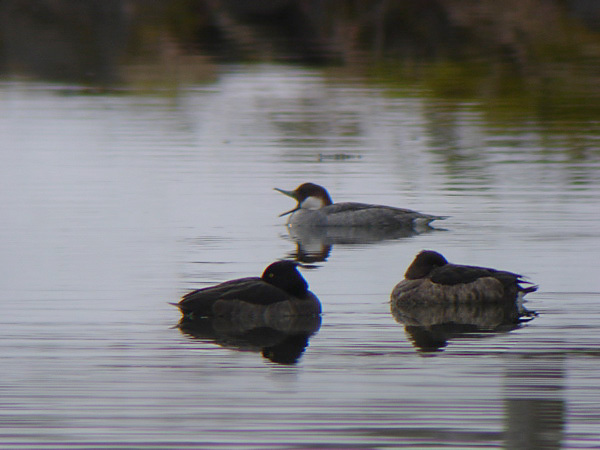 Yesterday's Smew defied my attempts to get a nice pic but this photo at least has a bit of character. A yawning immature (or female?) Smew with a couple of Tufted Ducks for company. prefer this new site DEP.